150 years ago, on October 19, 1868, the congregation of Lovettsville’s largest church, New Jerusalem Lutheran Church, laid the cornerstone for a new church building, which was completed a year later. This was necessary, because ten months earlier, the old church building, along with all of its interior furnishings, had been destroyed by fire. None of the extant church histories give any cause of the fire. Was it an accident, or was it intentionally set? If the fire was deliberately set, was it because of tensions remaining from the Civil War? Or, was there some other motivation? Under the date of Jan. 9, 1868, I received a letter from Rev. X. J. Richardson, of Lovettsville, Va., informing me that on the morning of the above date, their beautiful and recently re-modelled sanctuary, together with all its furniture, was reduced to ashes. It was the work of an incendiary. The building which burned was not at the church’s present location, but was in the old cemetery. The normal pattern in the 18th century, was to establish the burial ground around the church building. The first church and school, a log building, may have been erected as early as 1765, on land granted to the German Lutheran Church by George William Fairfax. It was known as “The Evangelical Lutheran Church at the Short Hill,” as this was long before the creation of the town of Lovettsville. Construction of a second edifice, an elegant stone building with galleries (balconies) on each side and aisles of dressed stone, began in 1802. In 1833, the church parsonage was built, the white frame building which still stands behind the old cemetery. In January 1839, a wall of the old stone church collapsed under the weight of a snowstorm, and within months the congregation began to rebuild on the same site. 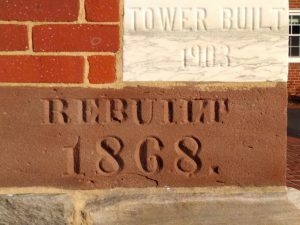 It had remained there through the Civil War, and had undergone a “thorough repairing” during the latter months of 1865. Then, a little more than two years later, that renovated building was destroyed by fire. The Lutheran Church (one of the handsomest churches) at Lovettsville, Loudoun County, was burned down on Thursday morning. The fire, it is thought, was the work of an incendiary. 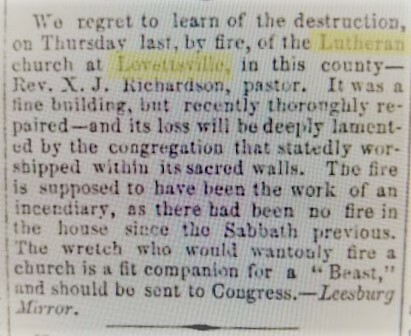 We regret to learn of the destruction, on Thursday last, by fire, of the Lutheran church at Lovettsville, in this county – Rev. X. J. Richardson, pastor. It was a fine building, but recently thoroughly repaired, and its loss will be deeply lamented by the congregation that statedly worshipped within its sacred walls. The fire is supposed to have been the work of an incendiary, as there had been no fire in the house since the Sabbath previous. The wretch who would wantonly fire a church is a fit companion for a “Beast,” and should be sent to Congress. The following week’s issue (Jan. 31) published a longer letter by Rev. Richardson, which we reprint here in full, to provide its vivid detail concerning the fire and the response of the church’s members. 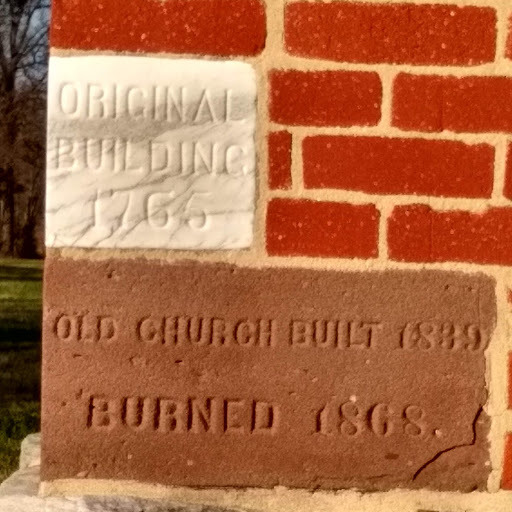 DESTRUCTION BY FIRE OF THE NEW JERUSALEM LUTHERAN CHURCH, LOUDOUN COUNTY, VA. It is with a sad heart that I announce the burning of the New Jerusalem Evangelical Lutheran Church, Loudoun county, Virginia, on the morning of the 9th instant. For those acquainted with the situation of things here, it will be a wonder how the parsonage buildings escaped. This was owing to everything being thoroughly saturated by rain, that had continued through the previous two or three days. Fortunately, too, the wind was favorable to us, carrying the clouds of fire, that arose from the burning building, past the house, about twenty yards North of it. Occasionally the wind, however, would change for a minute, bring the fire against the gable end of the parsonage, and scattering it over the roof, and twice it entered the garret through a broken window, and began to kindle, but was extinguished by my son, whom I had stationed there at the beginning, having discovered this danger. This is a most distressing calamity that has befallen us. Tender are the recollections and associations of a church, thirty years old—the third one on the same foundation—in which so large a congregation has worshipped, and in which have been witnessed so many scenes of both joy and sorrow. A little more than two years ago it was thoroughly repaired, painted, frescoed; and re-finished with new furniture. And though it was not all that was desirable, or the wants of the congregation demanded, still it was the best and most attractive church in this region of the country. More than that, it was our spiritual home. We loved it, and many have been the tears shed at the sight of its ruins. But the most painful reflection of all is, that the fire was, undoubtedly, the work of an incendiary. There had been no service in the church, and, of course, no fire in the stoves, since the Sabbath previous, and no conceivable supposition accounts for the fire by accident. From the fact, that the doors had not been opened, and from the appearance of things, when the fire was discovered, the incendiary must have entered the church through a window, and rolling a portion of the cocoa matting together, with which the aisles were covered, fired it near, or, in a closet, under the gallery. Who it was, we, of course, as yet, know not, and his motive we can only guess, but things of this kind cannot always be kept secret. This is a loss, for which my people are not prepared, and to repair it will cost no little self-denial and sacrifice. But, trusting in the promised assistance of our Heavenly Father, in every work, undertaken for the honor of His Name, and asking the sympathy and prayers of the church, we have already taken steps to rebuild. We have determined to erect a new building on another site, outside the grave-yard. Our plans are being conceived and decided upon, with energy and harmony, and, already, nearly $4000 have been subscribed. The building will cost $8000, perhaps more, judging from the cost of similar structures, and by the time the subscription is completed we hope to realise the full amount. The German Reformed brethren have kindly offered the use of their House of Worship every two weeks, until ours shall be built. X.J.R., Lovettsville, Virginia, January 21, 1868. After viewing the evidence first-hand, Pastor Richardson had no doubt that the fire was deliberately set. But, if anyone was ever investigated or charged for the church burning, no record of any investigation can be found 150 years later. The Loudoun County Sheriff’s Department says it has no records of investigations going back that far. Nothing can be found in any court records archived at the Loudoun County Court House. And only a few issues of local newspapers from those years have survived, none of which make reference to the fire. We do know that the Lovettsville area was fraught with tensions during the Civil War, and for many years after. In his Civil War Letters, Rev. Richardson described the state of lawlessness that existed here during the War, and lamented the lack of any government instrumentality to “protect the good and punish the wicked.” He reported that “The worst passions of human nature are aroused, and every man … is disposed to look upon his neighbor with suspicious distrust.” He described how they held no evening services for the first two years of the War, and then they organized clandestine prayer meetings at Tankerville and Morrisonville during the winter of 1863-64, meeting in secret for fear of discovery. New Jerusalem was overwhelmingly pro-Union during the War – unlike the German Reformed and the Presbyterian churches. 28 members of New Jerusalem enlisted in the Unionist Loudoun Rangers, while only a handful are known to have fought with the Confederacy. Was this a factor? We know that for a long time after the War, arguments between Unionists and Secessionists in this area could often end in violence. We may never know if the burning of New Jerusalem was a product of post-Civil War tensions and reprisals. 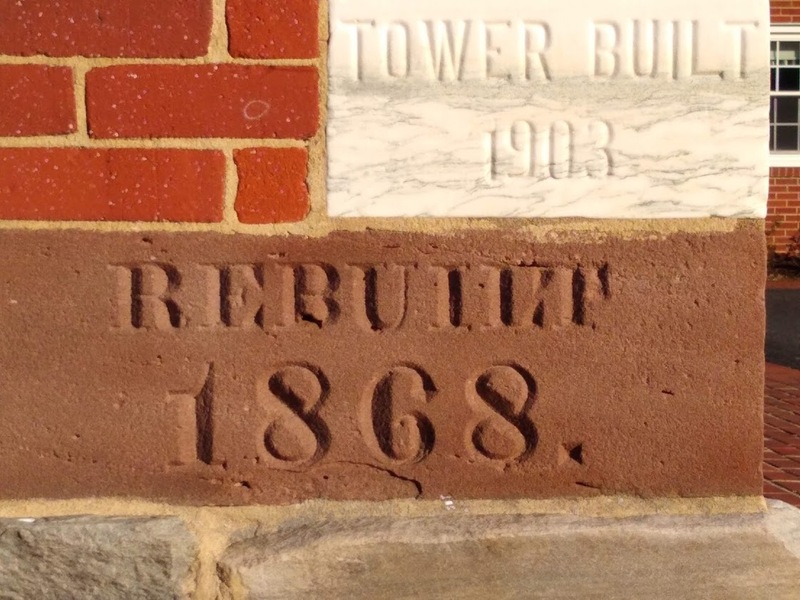 On August 19, 1868, the cornerstone was laid for a new building, and the following January, the ground-floor of the new building was dedicated in the presence of about 400 persons. It has been a little more than a year, January 9, 1868, since our former house of worship was destroyed by fire. The circumstances, under which we commenced to re-build, were, in many respects, of a discouraging character, but the Lord has blessed us with large prosperity in our efforts to erect this new temple to the honor of his name. The remainder of the building is almost ready for plastering, and will be completed as soon as possible after the opening of spring. We shall then have a better church, one better adapted to the wants of the congregation, than we had before…. The new building was dedicated on October 24, 1869. The editor of the Lutheran Observer, Rev. Dr. T. W. Conrad of Philadelphia, had preached in the old stone church some twenty years earlier, and now preached the first sermon in the new brick church. He described the new church building as being 74 by 45 feet, with an end gallery, and a basement above ground, plain in its style of architecture, neatly finished and tastefully furnished. It cost about $10,500. He pointed out that the congregation, then numbering 500 members, had been organized more than a century earlier, and that this was the fourth house of worship it had erected. It still stands today, a witness to a turbulent history. This would appear to be a reference to Union Major General Benjamin Butler, known as “Beast Butler” throughout the Confederacy. Butler was elected to Congress in 1866, and as served as a Representative from Massachusetts in the U.S. Congress from 1867 to 1879.